In the summer of 1981, owner Joe and his family moved to Plano, TX, where Joe worked as a service manager for a large heating and air conditioning company. After two years, he realized that HVAC service companies were charging too much and were responding too slowly in the hot summers. Finding his niche, Joe started Lone Star Comfortaire, where he pledged to provide affordable prices and quick response times. 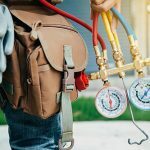 Since then, the technicians at Lone Star Comfortaire have been serving residential and commercial customers of Plano and surrounding communities for 35 years. If you are looking for affordable solutions and quick response times, Lone Star Comfortaire is the best company for you. Our mission is to satisfy our customers with quality work and reasonable prices. You will find that our technicians are honest and reliable. Our partnership does not end after one service call; we work hard to maintain relationships with our valued customers so that we can help with any future project, small or large. The most rewarding aspect of a Lone Star Comfortaire partnership is the value that you will take away after working with us. We pride ourselves on responding quickly, standing behind our work and, most importantly, never selling equipment that is not needed. Our company is built on honesty and that is what our customers will receive when working with us! Whether you are stressing over a broken air conditioning system on a hot day or you notice poor indoor air quality, our technicians are at your service. We provide 24-hour emergency services for all of our customers so that they are never in discomfort for too long. With Lone Star Comfortaire on your side, all of your HVAC needs will be met and your expectations exceeded. Call us at (972) 578-1701 or submit our online form to start building an HVAC partnership today!